In 1858 James Boag took over the running of the old pub which was then called the Old Blythswood Bar. The old building was demolished and a new tenement with a pub on the ground floor was erected in 1905. James Boag's nephew George Blair took over the licence in 1891 and when the new pub was built he became the new tenant. George also ran a pub at 164-66 Paisley Road West, many will remember this old pub as the Planatation Inn. 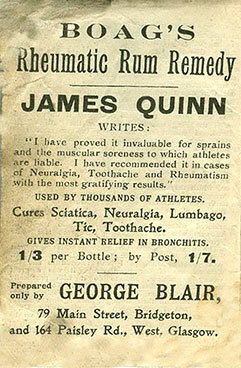 This early advert Boag's Rheumatic Rum Remedy. Other names this old pubs had... The George, Old Blythswood Bar, and George Blair.